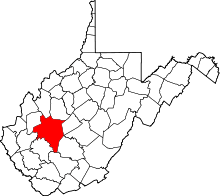 Charleston is part of Kanawha County. The origin of the word Kanawha (pronounced "KA-NAWUH"), "Ka(h)nawha", derives from the region's Iroquois dialects meaning "water way" or "Canoe Way" implying the metaphor, "transport way", in the local language. It was and is the name of the river that flows through Charleston. The grammar of the "hard H" sound soon dropped out as new arrivals of various European languages developed West Virginia. The phrase has been a matter of Register (sociolinguistics). In fact, a two-story jail was the first county structure ever built, with the first floor literally dug into the bank of the Kanawha River. Charleston is located at 38°20′58″N 81°38′0″W﻿ / ﻿38.34944°N 81.63333°W﻿ / 38.34944; -81.63333 (38.349497, -81.633294). It lies within the ecoregion of the Western Allegheny Plateau. Charleston functions under the Mayor-Council form of city government. The Mayor is the designated Chief Executive Officer of the city with the duty to see that all of the laws and ordinances of the city are enforced. The Mayor gives general supervision over all executive departments, offices and agencies of the city government and is the presiding officer of the Council and a voting member thereof. The current mayor is an Independent, Danny Jones, who was elected in 2003, and re-elected in 2007, 2011 and 2015. Jones was elected all four times as a Republican, but he announced on June 17, 2016, that he had decided to leave the Republican Party and register unaffiliated. Charleston also has a City Manager who is appointed by the Mayor and approved by the Council. The City Manager has supervision and control of the executive work and management of the heads of all departments under his control as directed by the Mayor, makes all contracts for labor and supplies, and generally has the responsibility for all of the business and administrative work of the city. With twenty-six members, the Charleston City Council is somewhat larger than usual for a city with a population of less than 50,000. Twenty of the council members are elected from a specific ward within the city, and an additional six members are elected by the city at-large. General Elections for Mayor, City Council and other city officers take place in May every four years (Primary Elections are held in March). The most recent election was in May 2015. Capital High School, a public school located in the community of Meadowbrook. It was established by the consolidation of Charleston High School and Stonewall Jackson High School. It opened in 1989. George Washington High School, a public school located in the South Hills neighborhood. It opened in 1964. Charleston Catholic High School, a Catholic school at the eastern edge of the city's downtown. It opened in 1923. Charleston High School, located across the street from where CAMC General Hospital is located. It was founded in 1916 and closed in 1989. Stonewall Jackson High School, located on the West Side. It was founded in 1940 and closed in 1989 to become a middle school. Stonewall Jackson Middle School on the West Side. John Adams Middle School in South Hills. Horace Mann Middle School in Kanawha City. 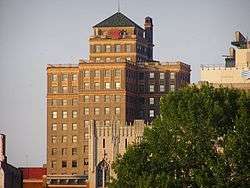 The city is also home to a 1,000-student private college, the University of Charleston, formerly Morris Harvey College. 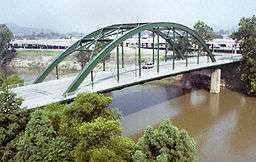 The college is located on MacCorkle Avenue along the banks of the Kanawha River in the community of South Ruffner. 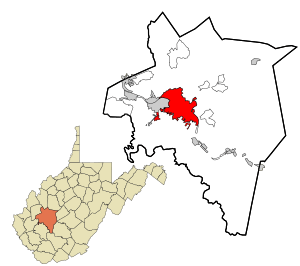 Located within the immediate area are West Virginia State University in Institute, BridgeValley Community and Technical College – South Charleston Campus, and the Marshall University – South Charleston Campus, both in South Charleston. The region is also home to the Charleston Branch of the Robert C. Byrd Institute for Advanced Flexible Manufacturing, an independent program administered by Marshall University; it provides access to computer numerical control (CNC) equipment for businesses in two states. Located approximately 30 miles (50 km) from Charleston, West Virginia University Institute of Technology has its campus in Montgomery, West Virginia. West Virginia University Institute of Technology is the largest regional campus of the University and focuses mainly on engineering programs. BridgeValley Community and Technical College – Montgomery Campus is also located in Montgomery. The City of Charleston recognizes the Charleston Area Alliance as its economic development organization. George Armitage Miller, one of the founders of the field of cognitive psychology, was born here. National Football League player Randy Moss grew up in Rand, adjacent to Malden, graduating from DuPont High School, which is now Dupont Middle School. Tennis player Anne White attended John Adams Junior High School and graduated from George Washington High School. Charleston's only major newspaper is the Charleston Gazette-Mail. Charleston has a total of 11 radio stations (AM and FM) licensed in the city. Most of the stations are owned either by the West Virginia Radio Corporation or by the Bristol Broadcasting Company. WKAZ* 680 AM Oldies The Oldies format was formerly on 107.3. WVPB* 88.5 FM Public Radio NPR News, Classical Music, Mountain Stage, and other local and national programs. WKWS* 96.1 FM Country 96.1 The Wolf. The station plays mostly country music, but also has a mix of Southern rock. WQBE-FM* 97.5 FM Country 97.5 WQBE. The Charleston MSA's #1 rated radio station, according to Arbitron. WRVZ 98.7 FM Rhythmic Top 40 98.7 The Beat. Despite the station's low ERP, it still competes well with Electric 102.7. The Charleston–Huntington TV market, is the second largest television market (in terms of area) east of the Mississippi River and 64th largest in terms of households in the US serving counties in central West Virginia, eastern Kentucky, and southern Ohio. There are four VHF and ten UHF television stations in the market. There are 21 high-rise buildings located in Charleston. 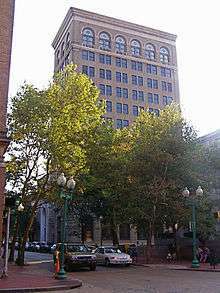 Laidley Tower is the tallest structure in the downtown area. Yeager Airport is West Virginia's largest airport serving more than twice as many passengers as all other WV airports combined. 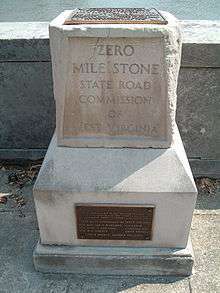 It is located 2-mile (3 km) north of Interstate 64 and Interstate 77, accessible via WV 114. Electricity in Charleston is provided by Appalachian Power, a division of American Electric Power of Columbus, Ohio. Appalachian Power is headquartered in Charleston. Suddenlink Communications provides the Charleston area's Cable TV. Landline phone service in Charleston is provided by Frontier Communications. The city's water supply is provided by Charleston-based West Virginia American Water, a subsidiary of American Water of Voorhees, NJ. The water that supplies Charleston is pumped from the Elk River and treated at the Kanawha Valley Water Treatment Plant. Charleston's natural gas is supplied by Mountaineer Gas, a division of Allegheny Energy of Greensburg, Pennsylvania. USAT General Frank M. Coxe was built in Charleston in 1922 by the Charles Ward Engineering Works. She served as an Army transport and later a cruise ship on San Francisco Bay. She is now preserved as a floating restaurant in Burlingame, California, just south of San Francisco. 1 2 "US Gazetteer files 2010". United States Census Bureau. Retrieved January 24, 2013. 1 2 "American FactFinder". United States Census Bureau. Retrieved January 24, 2013. ↑ "Charleston: History". City-Data.com. Advameg, Inc. Retrieved February 14, 2009. ↑ Nelson, Clarence M. (December 28, 2005). "Institute and WWII: Creation of Synthetic Rubber Plant Was Exciting". redOrbit. Archived from the original on September 20, 2009. Retrieved February 14, 2009. ↑ McKelvey, Tara (2015-10-22). "Obama promotes anti-heroin strategy in coal country". BBC News. Retrieved 2015-10-22. ↑ "Level III Ecoregions of West Virginia". U.S. Environmental Protection Agency. Retrieved September 29, 2013. ↑ "Charleston-Huntington Climate Summary - Eyewitness News Storm Team Weather". Wchstv.com. Archived from the original on March 4, 2013. Retrieved March 12, 2013. 1 2 "Average Weather for Charleston, WV - Temperature and Precipitation". The Weather Channel. Retrieved September 24, 2010. ↑ "NowData - NOAA Online Weather Data". National Oceanic and Atmospheric Administration. Retrieved February 29, 2012. ↑ "U.S. Decennial Census". Census.gov. Archived from the original on May 11, 2015. Retrieved June 5, 2013. ↑ "Charleston, West Virginia (WV) profile: population, maps, real estate, averages, homes, statistics, relocation, travel, jobs, hospitals, schools, crime, moving, houses, news". City-data.com. Retrieved March 12, 2013. ↑ "City National Bank". Cityholding.com. Retrieved March 12, 2013. ↑ "Symphony Sunday". West Virginia Symphony League. Archived from the original on June 8, 2009. ↑ "Astronaut Biography: Jon McBride". Spacefacts.de. Retrieved March 12, 2013. ↑ Simms, J.T. (July 6, 1999). "Women have long sports history". Daily Mail. Archived from the original on June 15, 2008. Retrieved April 24, 2008. ↑ Hollis, Mark (August 14, 1996). "Webster is Poised to Become House Speaker". The Ledger. Lakeland, Florida. The New York Times Company. p. D4. Retrieved September 1, 2010. ↑ "Charleston's Supertalk 950 WVTS - Home". Wvtsam950.com. January 11, 2008. Retrieved March 12, 2013. ↑ Archived September 26, 2011, at the Wayback Machine. 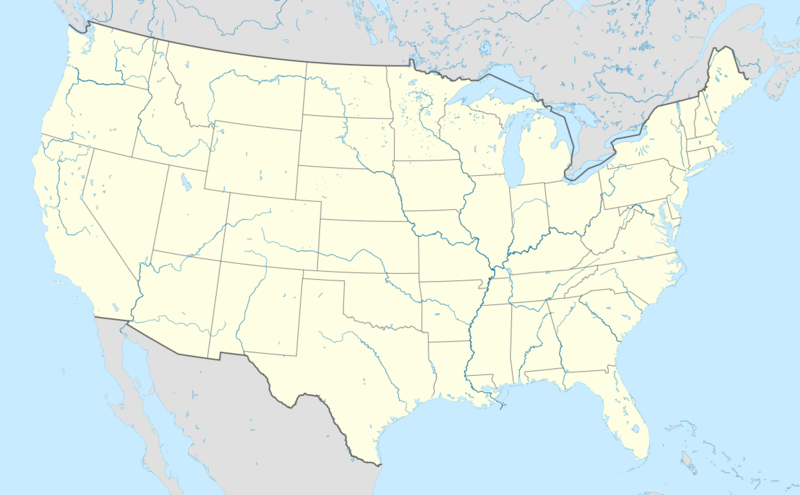 Wikimedia Commons has media related to Charleston, West Virginia. Wikivoyage has a travel guide for Charleston (West Virginia). "Charleston, a city, the capital of West Virginia". The American Cyclopædia. 1879. "Charleston. 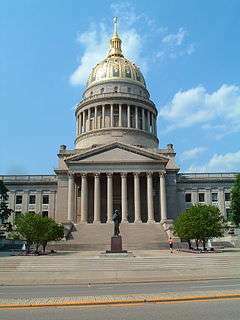 The capital of West Virginia". New International Encyclopedia. 1905. "Charleston, the capital of West Virginia". Encyclopædia Britannica (11th ed.). 1911. "Charleston, capital of West Virginia". The New Student's Reference Work. 1914. "Charleston, a city, capital of the State of West Virginia". Collier's New Encyclopedia. 1921.